One of the most important aspects of any SEO campaign is choosing which keywords to target. Once you’ve done your research and you’ve crafted a killer keyword list, you’ll need the right tools to track how your site is ranking for those terms. The UpCity Keyword Ranking Report has always been an excellent tool to aid in tracking changes in Google SERPs, but we’ve been working hard to make it even better based on great user feedback and suggestions! 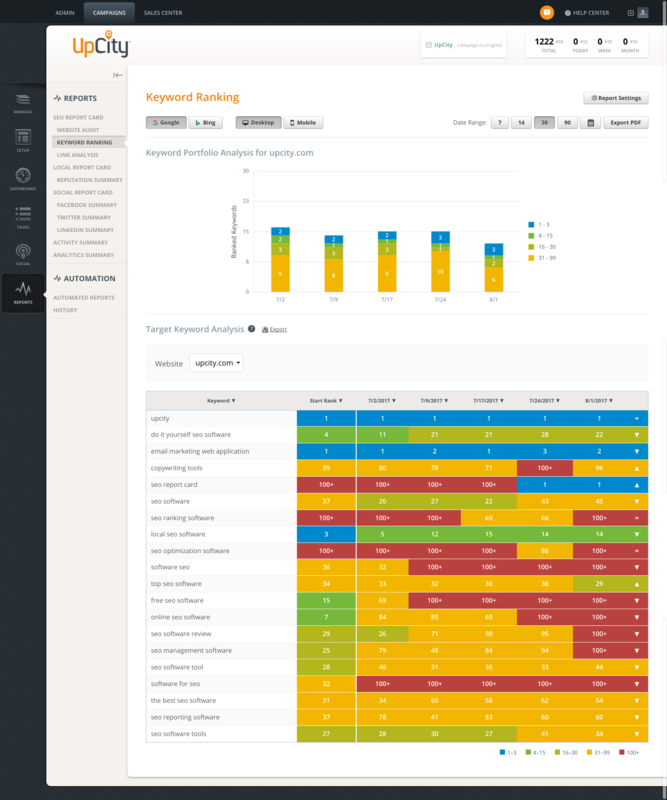 Today, we’re proud to unveil the largest update to our keyword reporting tools to date! We’ve revamped our keyword data to provide an increased emphasis on local and mobile rankings, added a new graph to help you better track your keyword portfolio, and implemented new customization and filtering options so you can view the report in new and interesting ways. The first change you’ll notice is our new color scheme! We wanted to make it easier for you to identify your successes, so we’ve added a new blue color to designate rankings in the top 3 spots of the SERPs. The next change you’ll notice is the new Report Settings. Previously, our ranking data was restricted to national results, meaning that if you wanted to track how your site ranks locally, you’d need to add local modifiers to your keywords (e.g. digital marketing chicago rather than simply tracking digital marketing). 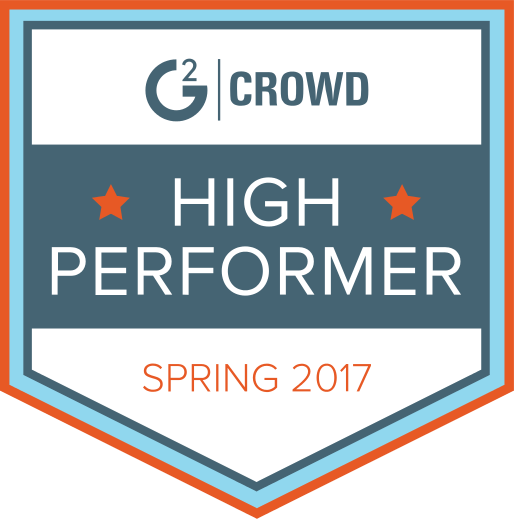 Now, we’ve greatly expanded your options and given you increased flexibility to track only the rankings you want and need. Google and other search engines are increasingly moving towards a mobile-first approach. To keep up with these changes, we’ve added the ability to choose between Google Desktop, Google Mobile, and Bing Desktop rankings. 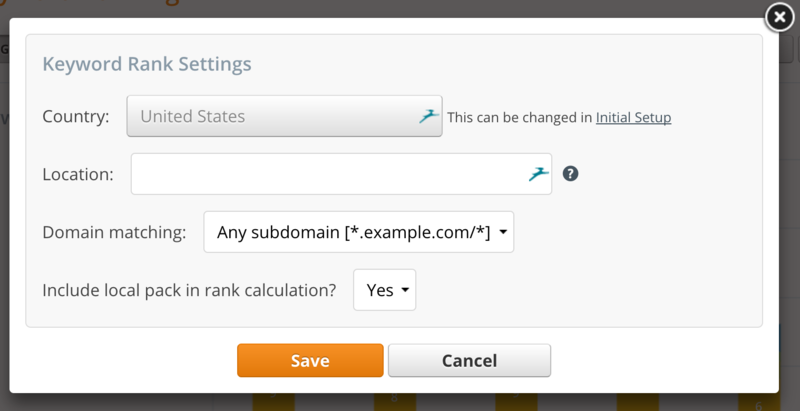 This gives you increased flexibility when it comes to choosing which rankings to display and when. As always, the country that you choose in the Initial Setup section will dictate the rankings we provide. This new update allows you to go a step further than simply choosing the country: you can now also designate a specific location. By default, we’ll leave this section blank so that you can decide which location you’d like to target. This ensures that any historical data that you’ve been collecting is consistent with future ranking pulls. When you mouseover the ranking data in the Target Keyword Analysis section, you’ll be shown the settings used to collect that particular pull. If something doesn’t look right in your report (e.g. a large drop or spike in your rank for a particular term), it’s likely that the report settings have been changed. We now provide you the option to choose how the report tracks your domain in search engine results pages. 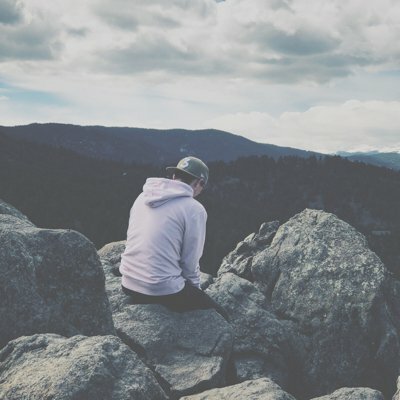 You can now choose from three options: any subdomain (*.example.com/*) which will report ranking data for any sub-folder or sub-domain related to your domain, your exact domain (example.com/*) which excludes sub-domains, or an exact page (example.com/services) which will only look for rank results that have that exact URL. The local pack in Google SERPs has increasingly become prime real estate when it comes to driving organic traffic. As such, we’ve always included the local pack in our ranking data. For example, if you’re the first organic result for a keyword that displays a local pack, our report would display 4 as your ranking. We know that not everyone wants to display the local pack in your ranking data, so now you can choose to turn it on or off as you wish. The previous iteration of our Keyword Ranking Report included a graph that tracked your rank for single keywords against your competitors. 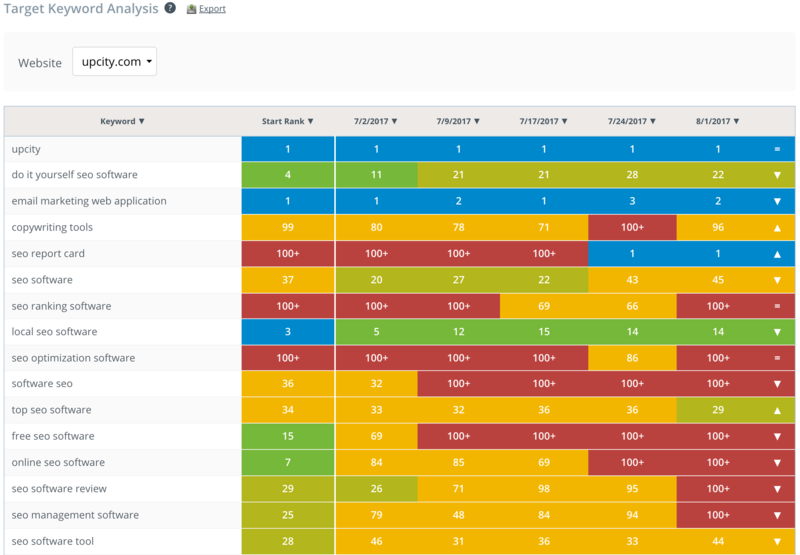 The new update replaces that graph with a new Keyword Portfolio Analysis chart. With this new graph, you’ll be able to monitor your entire keyword portfolio and visualize the breakdown of how your site ranks within the top 99 organic results. Since we first launched our Keyword Ranking Report, the only way to change the arrangement of your keyword list was to manually edit the order in the Keyword Targeting section of the Initial Setup. We heard your feedback and have implemented robust filtering capabilities so that the keywords and ranks you display always look exactly the way you want. With this newest update, you can filter by keyword, start rank, or current rank, as well as sort your entire list in ascending or descending order (to reorder your keywords based on how your site ranks). In addition, the filter(s) you apply will be carried over into any PDF export you generate. 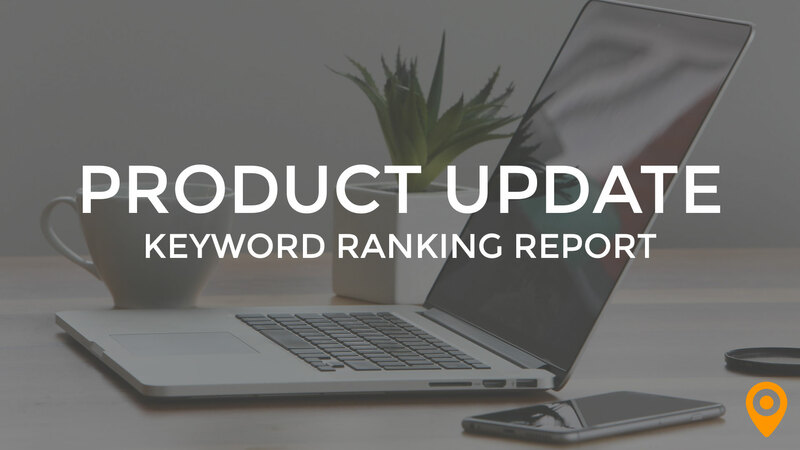 Learn More About How To Best Utilize the Updated Keyword Ranking Report! To learn more about how to best utilize our newly updated Keyword Ranking Report, visit our Help Center!